Over the past several years while running Iowa Starting Line, I’ve been to a lot of political rallies, forums, debates, fundraisers, protests and more county party potluck dinners than I care to mention. 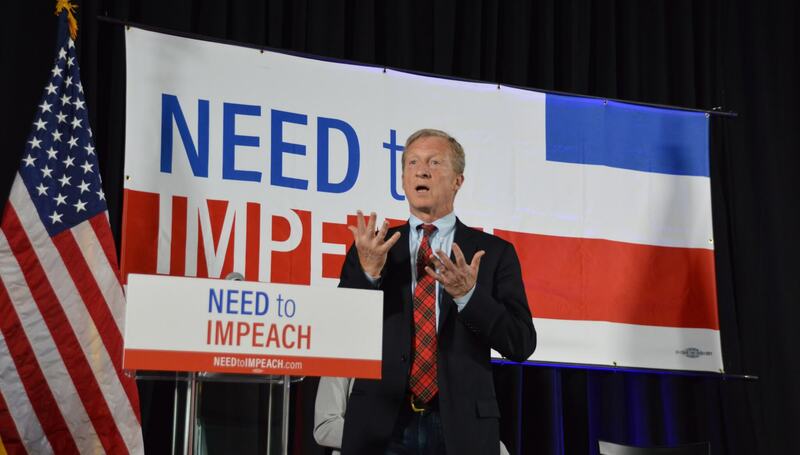 I don’t think I’ve ever been to an event like the one I attended earlier this week: Tom Steyer’s Need To Impeach town hall in Des Moines. And what I saw there may have been more informative as to the state of the Democratic Party and its future than any forum featuring all of Iowa’s current gubernatorial candidates. For starters, the place was packed. Around 400 people filled the Curate event room in the East Village where Steyer held his well-produced forum. Outside a couple of the major marches and state/county party fundraisers, that’s one of the best-attended gatherings that Democrats/progressive causes have had this year. None of the gubernatorial or congressional candidates (whose success this year is essentially do-or-die for state Democrats) brought out that many to their own stand-alone events. What was more interesting is who showed up. When I looked around the room, I didn’t recognize about 90% of the people there. That pretty much never happens. And many of your typical Democratic activists were nowhere to be seen. So, I started asking people what brought them out. I had checked the Facebook event page ahead of time, and only about 140 people were RSVPed – that’s the way most people hear about Iowa political rallies. Instead, nearly all the people there had gotten emails and invitations after having signed up through Steyer’s Need To Impeach website. Many joined Steyer’s email list after seeing his TV ads, which have been on heavy rotation in Iowa (Steyer spent $50,000 on WHO-TV during one week alone in late March). Charles Cantrill of Des Moines told me he’d signed Steyer’s online petition for impeachment (several attendees recounted the exact number they were when they signed). Of course, just getting invited to an event through an email list doesn’t automatically produce a large turnout. But it soon became clear why so many were drawn to come see Steyer. The event agenda itself was simple; Steyer spoke for about ten minutes and then opened up the floor for an hour and a half of questions. What followed was a fascinating, essentially cathartic experience for the attendees. People took turns at the microphone expressing their anger, fears and frustration about Trump, as well as politics or their life in general. It was like everyone came to say (politely) in public what they were shouting at their TVs, excited to do so in a room of like-minded people. Others laid out their life story and their difficulties getting by in Trump’s America. The event became a way for everyday Iowans, some moderately engaged in politics, others who aren’t, to express themselves in a way they felt they couldn’t. And Steyer, through as simple as a message of “impeach Donald Trump,” summed up all of their feelings of anger and frustration into one actionable goal. It all seemed to prove one of Steyer’s initial points about his call for impeachment. He’s been frustrated that so many leaders in the Democratic Party have criticized his effort, calling it either a waste of money that should be going to candidates or a counter-productive effort that distracts from Democrats’ overall messaging. “The political establishment in both the Republican and Democratic parties does not like what the American people have to say about this,” Steyer said in his introductory speech, adding in his conversation with me that Democrats are being too politically cautious on the matter. Anti-Trump feelings are what is fueling the Democratic base in 2018. Political analysts, candidates and party consultants like to point out that Democrats need to offer up more than just criticism of Trump, and that’s absolutely true. But certainly a stridently anti-Trump message has to be at least part of the conversation in order to activate and turn Democrats out to the polls. Simply reminding folks of what a Democratic-controlled Congress could do to investigate Trump would be helpful. Who provides that anti-Trump message can vary. Congressional candidates themselves don’t need to make their whole campaign about opposing Trump. But someone should be making that pitch to Democratic voters who stayed home in 2016; Steyer’s group is covering that base right now on the Iowa airwaves. The Democratic base is much less concerned about political niceties or cautious strategy than their national party’s leaders. They realize how terrible the Trump presidency is and see impeachment as a logical option. That should be informative to Democratic candidates promoting compromise with national Republicans as the “adult” way to act. Most rank-and-file Democrats have realized this current version of the Republican Party is not one you can negotiate with. The most important lesson may be for 2020 presidential candidates thinking of campaigning in Iowa. The party’s base here is looking for someone who will fight Trump, go toe-to-toe with him and call him out on all of his most outrageous controversies and scandals. They are overflowing with emotions, and are waiting for one person to capture that in a campaign. Some of the elected officials and older, longtime activists here might convince you that the party and nation is ready for a steady hand with a good resume who can lead a “return to normalcy” in the country. But those folks aren’t producing turnouts like Steyer’s. Both Bernie Sanders and Trump surprised each political party in 2016. A candidate who treats the Trump Administration like the corrupt, authoritarian threat to democracy itself that is is may be who surprises in 2020. There’s also signs of caution, however. Independents and Republicans sick of Trump aren’t necessarily automatically flipping their vote to Democrats. I also spoke with Andrew (who declined to give his last name), a young conservative from Ankeny who signed up for Steyer’s email list after seeing the TV ads. He was not, though, inclined to start voting Democratic this year. At best he said he might split his ticket in a few places, but was still planning on voting for mostly Republicans in other races. Regardless of what the final answer to many of the questions that Steyer’s push poses to the Democratic Party, people shouldn’t dismiss the effort – the reaction to it alone is fascinating and worth studying for any Democrat who wants to understand where the party’s base is at these days. This information sounds encouraging. In many instances the Democratic Party does not have a pulse of the registered members. If your not active they never ask your opinion. This latest gathering bringing Nancy Pelosi, I could not be bother even thinking of attending. She is old order and we need new leadership. The party cannot get this through their thick head. Many Democrats in congress need to make way for NEW members. Too many people there that have been there TOO long. The dynamics are old. Young fired up blood will get people out. Absent some significant change in congressional membership nothing will happen. Same in state government. I will not vote for Hubbell. Too old! Sorry. Impeachment of Trump may not be a realistic goal. It may be easier to get him to resign like Nixon did during Watergate. Either way it will be a tough fight. For Dems to win in ’18 and ’20 they have to do more than just be “anti-Trump.” What are they offering the working class white voter? The one that isn’t part of a special interest group or minority outreach?